South Africa will be the first country in Africa to host the 10th International Conference of Ombud Institutions for the Armed Forces (ICOAF), which will take place from 30 September to October 2018. The Ombud’s office noted that the ICOAF was established in 2009 with the aim of establishing best practice and to learn lessons related to the mandates, powers and functioning of these institutions. ICOAF gathers representatives of ombuds institutions for the armed forces from around the world. To date, representatives of ombuds institutions of over 50 states have participated in the ICOAF initiative. The South African delegation which is currently attending the ninth ICOAF in London took over the organizing of this event on 10 October, where the Military Ombud Lt Gen (Ret) Temba Matanzima addressed the delegates of the conference. In his acceptance speech Matanzima said the Ombud feels immensely honoured and privileged to be given an opportunity to host the 10th ICOAF conference in South Africa. “I am delighted that South Africa is going to host this important conference which is taking place for the first time in the continent,” said Matanzima. He said the 10th ICOAF will continue to explore ways to share experiences to ensure that conditions of service are not violated within the armed forces. He told delegates that they have a massive task ahead as the custodians of human rights within the armed forces in their respective countries in making sure that soldiers are protected at all times. 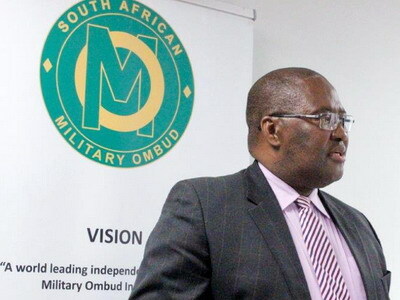 Matanzima further said Ombud institutions should not be deterred in their efforts to hold the armed forces accountable when they are found wanting for violating the rights of current and former members of the military. “I believe that there is still much that the Ombud Institutions can learn from each other when it comes to promoting good governance. As Ombud institutions we need to recognize our responsibility in shaping the armed forces to continuously respect the fundamental rights of its soldiers,” said Matanzima. The proposed conference topic for the ICOAF 2018 event is “The Evolving Roles And Responsibilities Of The Armed Forces And The Implications For Ombuds Institutions”. South Africa, being the only African country with a Military Ombud Office, will use the “Africa Day” session of the 10th ICOAF on 3 October 2018 to motivate and encourage the rest of the continent to institute the military ombud concept from their own perspective. The South African Military Ombud was established to investigate complaints lodged in writing by a member and former members of the South African National Defence Force (SANDF) regarding their conditions of service. The Office also investigates complaints brought by members of the public against SANDF member’s personal conduct in public.